For the first time Metal Matrix Composites (MMC) have been investigated by 3D Computed Tomography combined with enhanced interface contrast due to X-ray refraction. X-ray refraction is a relatively new approach for the characterization of advanced materials. The related techniques of Refraction Topography and Refraction Computed Tomography have been developed and applied at our laboratory during the last decade to meet the actual demand for improved non-destructive characterization of high performance composites, ceramics and other low density materials and components. X-ray refraction occurs, when X-rays crosses interfaces of spherical or cylindrical shape (e.g. pores or fibres) in the same way as visible light is refracted by lenses. These X-ray optical effects can be observed at small scattering angles of few minutes of arc as the refractive index n of X-rays is nearly unity (n = 1  10 -6 ). Due to the short X-ray wavelength of about 0.1 nm the technique determines the amount of inner surfaces and interfaces of nanometer dimensions. The technique is expected to solve many problems in understanding the meaning of micro and sub micro structures in materials science. With the results of the CT investigation, some questions could be clarified for a bet-ter understanding of fatigue failure mechanisms under cyclic loading conditions. The specimens for the test programme have been provided by MTU Aero Engines. They consist of a titanium matrix (Ti6242) reinforced by SiC fibres (SCS6). The investigations have been performed at the materials research station of BAM (BAMline) at the Synchrotron Facility BESSY in Berlin, Germany. KEY WORDS: Non-Destructive Inspection (NDI), Characterization, Titanium Metal Matrix Composites (Ti-MMC), Ti6242, SCS6. The non-destructive characterization of high performance composites, ceramics and other advanced materials can be difficult. Anisotropy, heterogeneity and complex shapes reduce the performance of traditional non-destructive techniques, which have been optimized for isotropic single phase materials, preferably for metals. The effect of X-ray refraction provides unconventional small angle X-ray scattering (SAXS) techniques which have been developed and applied in the last decade at our laboratory to meet the actual demand for improved non-destructive characterization of advanced materials. X-ray refraction reveals the inner surface and interface concentrations of nanometer dimensions due to the short X-ray wavelength near 0.1 nm. Sub-micron particle, crack and pore sizes are easily determined by "X-ray refractometry" without destroying the structure by cutting or polishing for microscopic techniques. Metal Matrix Composites (MMC) are basic materials based on metal alloys reinforced by ceramic fibres. These composites combine high tensile strength with low specific weight. But there mechanical properties are strongly influenced by the fibre orientation and the interface between the fibre and the matrix as well as the distribution of cracks and pores. While the orientation of the fibres is defined by the production process, the interfaces are also subjected to thermal and mechanical loading of the composite. Since several years titanium based alloy matrices reinforced by SiC fibres (Ti-MMC) are developed in the laboratories of the air and space industry. 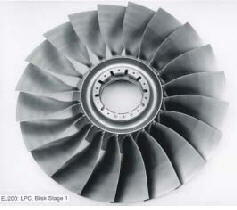 Used in aircraft engines they can reduce the weight of structural and functional components up to 50 %. The manufacturing technology of Ti-MMC compounds is very challenging but the possibility of non-destructive inspection and characterization of these materials is up to now rather poor. 3D X-Ray Refraction Computed Tomography is a promising tool to reveal the changes and development of the inter surfaces (e.g. fibre-matrix interface, cracks and pores) of those composites. The physics of X-ray refraction is quite similar to the well known refraction of the visible light by optical lenses and prisms, which is governed by Snells law. However a major difference to the visible optics is, that the refractive index n of X-rays in matter is nearly one (1). This causes deflections at very small angles in the order of a few minutes of arc. e is the real part of the complex index of refraction, r the electron density and l the X-ray wavelength. In case of X-rays, where n < 1 the converging effect of convex lenses changes to divergence. Fig. 1 demonstrates the effect of small angle scattering by refraction of cylindrical lenses: A bundle of glass fibres with a diameter of 15 ľm each as used for glass fibre reinforced plastics (GFRP) deflects collimated parallel X-rays within several minutes of arc. 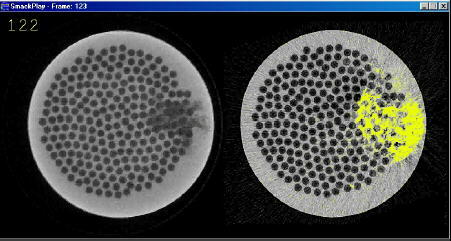 In fibres and spherical particles the deflection of X-rays occurs twice, when entering and when leaving the object (see magnification in Fig. 1). The oriented intensity distribution is collected by an X-ray film or a CCD camera while the straight (primary) beam is omitted by a beam stop. The shape of the intensity distribution of cylindrical objects is always the same even for very different materials, if the scattering angle is normalized to the "critical angle" qC of total reflection (see Fig. 2). This parameter depends only on the refractive index: q2C = 2 e . The intensity of the deflected X-rays falls down to nearly zero at the critical angle of total reflection (see Fig. 2). Fig 1: Effect of oriented small angle scatter-ing by refraction of glass fibres. Fig 2: The normalized shape of the angular intensity distribution of cylindrical objects. J0 is the irradiation density of the incident X-ray beam onto the fibre, R is the radius of the fibre and 2q=q is the scattering angle. The SAXS instrumentation is relatively simple (see Fig. 3) but sometimes delicate in terms of its (thermo-) mechanical stability. It requires a collimated X-ray beam, a specimen manipulator, an X-ray refraction detector and a reference detector to monitor the specimen absorption and beam stability. The refraction intensity can be measured (3) according to Eq. 3. The conventional understanding of "continuous" small angle X-ray scattering (SAXS) is governed by the interpretation of diffraction effects. Apart from Guinier's theory for separated particles Porod (4) explains diffraction of densely packed colloids similar to Eq. (3). However both deal with particles two orders of magnitude smaller. 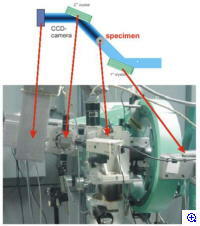 Fig 3: Figure 3: Basic principle of a SAXS instrumentation with collimated X-ray beam, specimen manipulator, a refraction detector, which measures the refracted intensity IR of the specimen or IR0 if the specimen is not in place and a reference detector, which measures the intensity IA0 (without specimen) or IA (with specimen), respectively. A model composite has been made in order to demonstrate the refraction behaviour of a bonded and debonded 140 ľm sapphire fibre in a wax matrix (Fig. 4, left). The upper ray crosses the bonded fibre-matrix interface causing a small amount of deflected intensity. At the debonded fibre and at the matrix surfaces (lower ray) much more X-rays are deflected, as the larger density difference between the materials and air corresponds to a higher index of refraction. Fig 4: left; Model composite made of wax with a bonded (top) and debonded (bottom) 140 ľm sapphire fibre. Middle; X-ray refraction at the interface of the bonded (top) and debonded (bottom) fibre. Right; X-ray transmission topograph of the model composite. To enlarge the propulsive force of the next generation of aircraft engines some fundamental constructive changes has to be done. E.g. the design of the compressor section has to be changed from bladed disks (BLISK, Fig 5 left) to bladed rings (BLING, Fig 5 right) to archive a larger hub bore diameter for new compressor designs. This constructive changes pre-suppose new materials which have the same stiffness at a lower weight. Fibre reinforced Titanium Metal Matrix Composites are especially suited to be used in the compressor part of an aircraft engine. 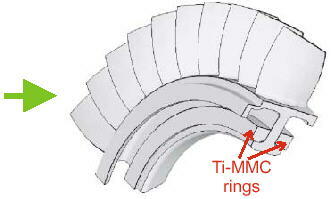 Fig 5: Bladed disk BLISK Bladed ring BLING, larger hub bore diameter for new compressor designs; lower weight at same stiffness. The cylindrical specimens for the test programme have been provided by MTU Aero Engines. As reinforcing fibre the SCS6-fibre from Textron was taken. It has a 33 ľm diameter carbon fibre as a core with a 1 ľm pyro-C-protective coating, followed by SiC and again by a pyro-C- protective coating of 3 ľm (see Fig. 6). The overall diameter of the fibre measures 140 ľm. Fig 6: Assembly of the SCS6-fibre from Textron. 1: pyro-C-protectiv coating, 2: SiC, 3: C-fibre, 4: pyro-C-protectiv coating. Fig 7: Procedure of Low Cycle Fatigue specimen manufacturing. The fibres are coated (30 ľm) with the titanium base alloy Ti6242 by magnetron sputtering and than bundled and formed by Hot Isostatic Pressing (HIP) (see Fig. 7). Static and cyclic forces were applied parallel to the fibres which leads to the evaluation of the mechanical parameters. After the tests the specimens were examined by metallographic methods and the fractured surfaces were analysed. 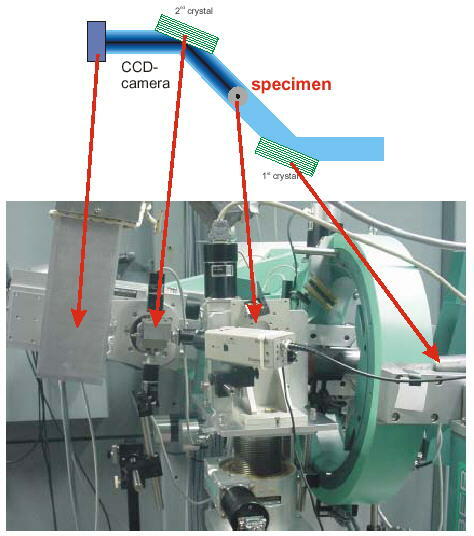 As a new approach for non-destructive testing the specimens were investigated by 3D X-ray Refraction Computed Tomography at the materials research test station of BAM (BAMline) at the Synchrotron Facility in Berlin (BESSY) as well. The investigations should reveal whether the development of cracks and fibre failures after tensile load is distributed homogeneously across the sample, or locally concentrated. In our laboratory we have employed conventional X-ray tubes, crystallographic small angle scattering cameras and scintillation counters, respectively. The specimens where scanned or rotated across a single beam under pre selected fixed scattering conditions in order to receive spatial resolution. However the measurements are relatively time consuming and due to low X-ray energies from characteristic radiation of Cu- and Mo-anodes restricted to low density materials. Most of these disadvantages have overcome by use of synchrotron radiation. At the Berliner Electron Storage Ring for Synchrotron Radiation (BESSY) the Federal Institute for Materials Research and testing (BAM) has build up a hard X-ray beamline (5) and an X-ray laboratory for materials research. The usable photon energy range of the beamline extends from 5 keV up to 60 keV for monochromatic radiation. The main advantages of Synchrotron Radiation are the high photon flux, the continuous energy range and the highly collimated and parallel photon beam, respectively. With the help of a monochromator system the appropriate photon energy can be chosen for the investigations. The experimental set up is sketched in Fig. 8. Fig 8: Sketch and photograph of the experimental set up at the BAMline Fig 9: Rocking curve of the Si(111) single crystal pair in symmetric configuration from Fig. 8; with specimen (filled square) and without specimen (star) between the two crystals. The area under the curves is set to equal. Although two-dimensional refraction topography provides an effective new probe for analysing meso-structures of all kind of heterogeneous materials, it is sometimes interesting to have section images of transversal resolution as known from X-ray computed tomography in order to overcome the overlap of details by projection effects. The measurements were performed by rotating the specimens around there cylindrical symmetry axis for 360 degrees in steps of 1 degree. After each step an exposure was taken. The data sets were analyzed by filtered back projection as known from the data treatments for conventional absorption CT. Fig. 10 shows the reconstruction of one plane out of 300 planes of the absorption data set, which was taken in our CT-laboratory (100 kV, 4,7 x 4,7 x 4,7 ľm3 Voxel). It shows the cross section of a LCP specimen. The reinforcing SiC-fibres are shown up as dark discs with a slightly darker core. They are not symmetrically arranged to the rotational axis of the specimen. A crack (dark area) can be realised in the right part of Fig 10, which corresponds very well with the visible crack at the cladding of the specimen. No further indications can be seen for cracks or fibre failure in the remaining area. Fig 10: Reconstruction of the absorption measurement. 100 kV, 4,7 x 4,7 x 4,7 ľm 3 Voxel. Fig 11: Reconstruction of the refraction measurement. 50 keV, 5,3 x 5,3 x 5,3 ľm 3 Fig 12: Reconstruction difference of a plane with single fibre failure and matrix cracks to a plane without failures. Voxel. Specimen between two crystals. All fibre failures in the reconstructed plane crop up as light-grey discs. The matrix cracks appear as grey areas. The deviation of the fibre positions with respect to the reference plane show up as a half-moon. All other areas which are not different form the reference plane are black. The outer shape of the specimen is marked by a red circle. 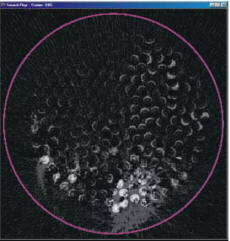 X-ray refraction techniques combine analytical capabilities of sub-micrometer structure detection with the requirements of non-destructive full volume characterization. Its potential of contrasting cracks and pores will be an alternative to other attempts on raising the spatial resolution of CT machines. X-ray refraction therefore might help faster materials development, better understanding of meso-structures and partly replace micro analysis and mechanical testing in advanced materials science. A. H. Compton, S.K. Allison, X-ray in Theory and Experiment, Macmillan and Co. Ltd., London, 1935. M.P. Hentschel, R. Hosemann, A. Lange, B. Uther, R. Brückner, Acta Cryst. A 43, 506 (1987). M.P. Hentschel, K.-W. Harbich, A. Lange, NDT&E International 27, 275 (1994). G. Porod, Kolloid.-Z. 124, 83 (1951).